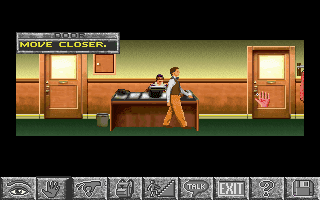 After the opening cutscene we went through in the introduction post, we start the game with Jason Roberts arriving at work. As always when starting a new game, I look at everything I can see. Just what I wanted – a mundane description of each individual part of an everyday item. Looking at the green (sorry, olive drab) car's trunk tells me it's locked. 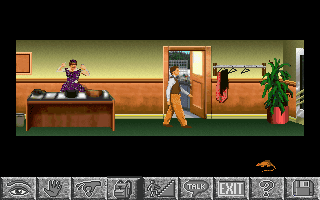 I make a mental note to try to steal the key from the owner (Darlene) at some point, as leaving anything locked just isn't done when playing an adventure game. I enter the office. I find it much easier to navigate by using the arrow keys rather than the mouse so I'm glad the game gives me that option. The most useful looking item in the first part of the office is a wire coathanger. I take it. Sigh! You're going to make me do this a lot, aren't you, game? The corridor scrolls to the left and contains quite a few doors to various offices. Darlene sits at her desk so I talk to her. 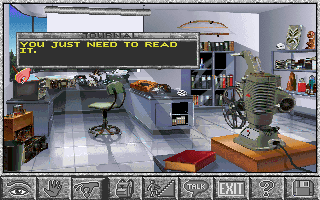 The conversation interface is much like Martian Memorandum, and possibly like Martian Memorandum I'll have to choose my responses correctly in order to solve the dialogue puzzle. 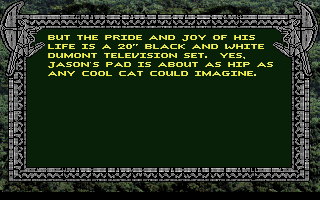 Or I could just choose the responses that make Jason sound like an a-hole. And sometimes all of the options are just varying levels of a-holery. After a few attempts I get the option to ask about a key to a locked cabinet in my brother's office. 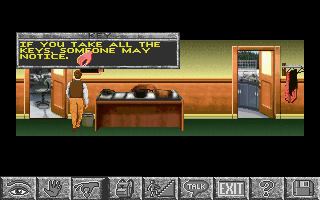 I haven't been to any of the offices yet, but now I know I'll need a key – the game doesn't assume I have information I don't yet, as Jason specifically mentions seeing the cabinet 'the other day'. Having not gotten anything too useful from Darlene, I decide to enter one of the offices. 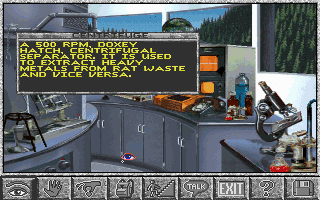 My office contains various scientific apparatuses, and a brown rat in a cage. It extracts rat waste from heavy metals? That seems... infinitely improbable. I take some alcohol from my cabinet (not the fun kind of alcohol) and talk to my rat. 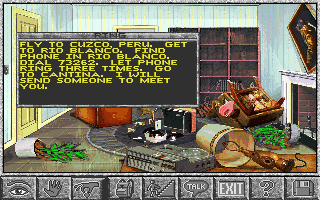 And here I was, happy that I hadn't found a spelling error in this game. My intercom has a message that calls me into the boss' office. So I enter my boss' office at the end of the hall (MOVE CLOSER). My boss inexplicably turns his back on me before telling me about my brother's mysterious disappearance. He tells me to go home and rest after hearing the bad news. If this is three, what's this? Not having to be told to take the rest of the day off twice, Jason drives straight home. Ah, 'cutting edge technology of the past being vastly inferior to normal technology of the present' humour. Just inside my door is a brown package from South America. I try to open it. Seriously, game! Seems like a lame excuse for a puzzle, but if you insist. I take the letter opener from the table and open the package. Oooh – you were so close to having each line begin with “THE” - so close, and yet so far. I pick up the letter and am amazed - I can tell I'm amazed because of the amazed look on my face. And thus we come to the end of Chapter 1. Is this the lamest cliffhanger ever cliffhung? The letter I was shocked to read at the end of Chapter 1 was from Allen. I'm somewhat surprised that the letter was from after the expedition was attacked in the opening cutsene. So now we know that Allen definitely wasn't killed in the attack. In the letter, Allen gives us a lot of information and instructions on how to proceed. He mysteriously says the the expedition was savagely attacked by someone or something, but he won't tell me all the details until we meet. The expedition was on the verge of a great discovery which ruthless men will stop at nothing to get their hands on. Allen believes supernatural powers are pursuing him. I must get the contents of his storage drawer at work, read his microfilm and bring everything to him. I must do all this without anyone else knowing about him. He sent me a key to his cabinet, which I can use to get the combination to his safe. ALLEN – JUST GIVE ME THE COMBINATION TO THE SAFE AND SAVE ME THE EFFORT! He's written instructions on how to find him. 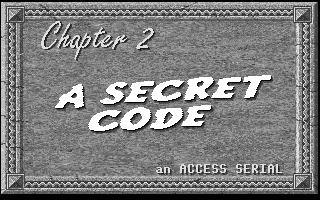 But it's encoded in a form that needs to be decoded by a decoder ring we used as children. My house also contains a reel-to-reel tape recorder. I expect I'll be needing that shortly. The package also contains a key to Allen's office cabinet, which I take. 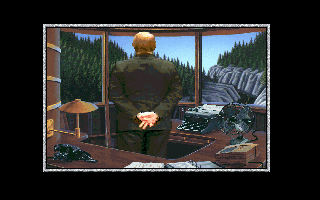 Not finding anything else in my house, including the decoder ring, I go back to work and enter Allen's office. I take darts from Allen's dartboard and a blowgun from the wall. I use Allen's key to open his cabinet, and take a reel to reel audio tape. I read Allen's journal and take it. Okay, I read Allen's journal and don't take it. I take a movie reel and put it in Allen's projector, pull down the screen and turn the projector on. It doesn't seem useful - it just plays a short silent film called “Wild Women of Wongo”. I find a book that gives me instructions to make a love potion. I have alcohol from my office and Allen's office contains the other ingredient – a jungle weed known as “the heart”. I can boil the mixture in my office where I previously noticed I have a bunsen burner. I already have darts and a blowgun – this seems easy so far! … or has just eaten something sour. Using our shared grief, I attempt to get Darlene to give me the key. Ignoring the cabinet for now, I attempt to go to the office's security vault. To my surprise I found that the door leads, not to another office, but to a backyard with an extremely secure looking mountain entrance. Being a valued employee, I attempt to enter. Yeah, you and what army. Aw, why don't I get a named singlet like my roommate, Bruno? Instead of making my way nonchalantly to the vault, I look at my surroundings – looking at the male guard tells me his life is missing the love of a good hearted woman. Looking at the female guard gives me an even more blatant hint. I love that I know all about these guards' romantic lives and desires, but I don't know their names and refer to them purely by their gender and broad job description. I open the cage and take my rat, letting him loose near Darlene. She screams and runs away. Don't worry, Darlene, while you're gone I'll take care of the key cabinet behind you. I can't do anything with the items on Darlene's desk, but I can open the key cabinet and take two of the keys, the keys to Darlene's car trunk and the key to Allen's cabinet. I can't take any of the other keys. But leaving the key cabinet open with two of the keys missing is totally unnoticeable. I take the jungle weed from Allen's office cabinet and then go to Darlene's trunk, where I find some more useful items. Does Darlene have a side job as a professional thief? Is she secretly Catwoman? I combine the alcohol and jungle weed in my inventory, then put the combined liquid on the bunsen burner until it goes green, as the instructions stated. I then use my dart with the liquid, and the blowgun with the dart to make a “loaded blowgun”. I go outside, ready to hit my good friend, Male Guard, with love potion #9. The game tells me I can't see him from where I stand, so I climb a tree stump. I then get told I don't have a clear shot at him. As he walks around the area I try multiple times. I get told I don't have a clear shot a lot, and try to think of something else I need to do – I attempt to use my bolt cutters on the branch in front of me in order to get a clear shot but that isn't the solution – there's a very small window of time where the guard is in the perfect position and I eventually find it and shoot Male. 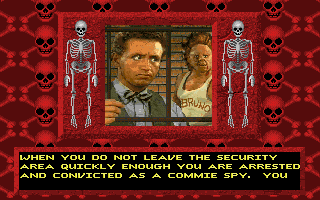 Then the game goes all Looney Tunes with a closeup of the guard. This happens while the sound effect of a steam train plays. Now that Male Guard in in drug-assisted-love, the two guards walk hand-in-hand to the bushes shortly before some clothes and something small fly out. I hear occasional happy sounds from my friends, Male and Female. As I walk towards the clothes, a bear wanders in from the right, and goes to the garbage bin. I reload to before I shot the dart and go back to all previous locations looking for a sandwich or something else that would count as bear food. I didn't find any food, but did find that someone else had been to my house while I was at work. On the bright side, one of the pixels on the screen is alternately glinting red and yellow. Ignoring the possibility that my monitor's faulty, I look at the pixel and find my Orphan Annie Decoder ring. I can now use the ring to decode Allen's secret message. While in my apartment, I also use the audio tape I found in Allen's office on my tape recorder, which fortunately still works. The tape is a recording of Allen telling me the combination to his safe. I write the combination on a scrap of paper, which now appears in my inventory. Unfortunately I don't think I can look at anything in my inventory so I (the player) don't actually know the combination. Having not found any bear food anywhere, I go with the other idea I had – I use my bolt cutters on the chain holding the garbage can lid on. That works, as there was already food scraps in the garbage. 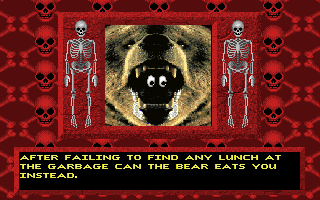 While the bear rummages through the garbage, I take the small item next to the thrown clothes (the key to the vault) and use it on the vault door. I enter the now open door and am greeted by a security robot called Bob who says in his robotic monotone, "The intruder must be terminated" before the episode ends. And, with two chapters down, we'll stop for now. 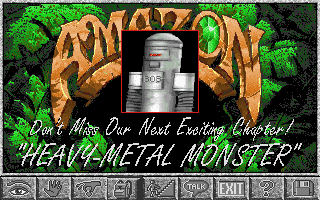 Next time I'll attempt to deal with the Heavy Metal Monster. Tune in next time to see if Jason can cope with a high caffeine count? oh no wait, you must start again and use the TV ! What kind of player are you ? that's one of the best gags in the game, the audio that plays is nuts ! I did turn on the TV but neglected to mention it. For those who don't know it loops a few seconds of Three Stooges along with some of their catchphrases. 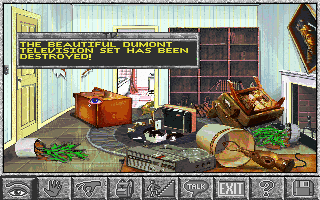 You're right, the audio is absolutely nuts if you leave it on while exploring the room, purely due to the repetition. I turned it off after I realised it was a short loop though and am not sure if I regret that decision or not. It doesn't seem useful - it just plays a short silent film called “Wild Women of Wongo”. There is a real movie with this title, tropical-island schlock, not silent though. (A short-lived project called The Film Crew, featuring MST3K alumni Mike Nelson, Kevin Murphy, and Bill Corbett just before they started doing Rifftrax, did it as one of their episodes.) Does the game merely mention the title, in which case I suspect it's just a joke, or is there more and it might possibly be a hint of some kind? 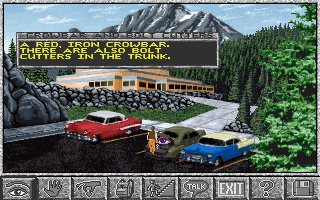 I'd have suspected it might be a reference to the Film Crew's version, but this game came out way too early for that. And thanks for that info - I didn't know they did anything between MST and Rifftrax! 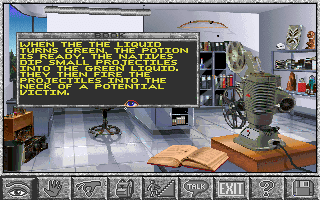 And for some Film Crew/Access Software trivia, Kevin Murphy played a significant role in the most recent Tex Murphy game, Tesla Effect, which shares many of the same developers as this game. No wonder the American Postal service had such a good reputation for reliability, they were securing their packages with high tensile strength twine! And here the rest of the world was struggling with packaging tape like a bunch of chumps. Maybe it is a secure knot as well? You're right about the letter openers, if they had a sharp edge it would just become a very specific name for a knife. Let's not forget how our US Postal Service also takes a few extra minutes (or days) on each leg of the journey, carefully deliberating their next move, before delivering the package. Because their motto has always been "Yeah, we'll get it there eventually..."
So, time for Weird Access Software Coincidence story #2: back when Tesla Effect was new, the creators purchased a booth at the then-new Salt Lake Comic Con (before they got sued by the San Diego Comic Con and had to change their name) to advertise it. A co-worker of mine used to work at TruGolf (a company Access eventually morphed into) and was asked to help man the table for most of the day. I didn't get to man it with him, but I did get to meet Kevin Murphy, who was sitting at the table along with the guy who voices Tex (whose name escapes me right now) and also the Soup Nazi from Seinfeld, who I guess is also in Tesla Effect somewhere (not *as* the Soup Nazi, presumably). I got him to sign an Interociter toy (from This Island Earth, the film featured in the MST3K movie) I found elsewhere at the con, so now, thanks to Access Software (or what it turned into), I have a picture of myself with Kevin Murphy, a toy interociter, and the Soup Nazi. That has very little to do with this game, but it's a fun story anyway. 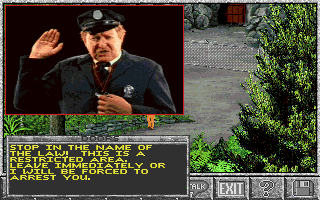 Regarding this game, I seem to recall the clip of the guard with steam coming out of his ears. 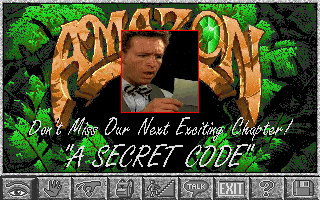 Maybe they played it for the kids when I visited Access when I was 10 years old or so (I posted a comment about this under the intro post) because it had a funny sound effect? If so, I hope they didn't explain the context to a bunch of children. Great story, MisterKerr, and also coincidentally, I found an interociter in the next chapter of the game! Were Darlene's close-ups actually screenshot stills from episodes of Judge Judy?